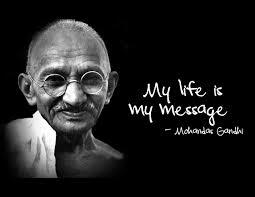 Mohandas Karamchand Gandhi was born on 2 October 1869: 150 years ago this year. There will be many tributes to Gandhi published in 2019 so I would like to add one of my own. This reflects not just my belief that he gave the world inspiration, ideas and powerful strategies for tackling violence in a wide range of contexts but because my own experience in applying his ideas has proven their worth. This included his awareness that led him to declare that ‘If we are to make progress, we must not repeat history but make new history. We must add to the inheritance left by our ancestors.’ and his encouragement to reflect deeply and listen to one’s ‘inner voice’: ‘you should follow your inner voice whatever the consequences’ and ‘even at the risk of being misunderstood’. In essence, we can productively learn from history but we can build on it too. And, vitally, this includes dealing more effectively with violence. So how did Gandhi influence me? Shortly after midnight on 1 July 1942, my Uncle Bob was killed when the USS Sturgeon, a U.S. submarine, fired torpedoes into the Japanese prisoner of war (POW) ship Montevideo Maru. The ship sank immediately and, along with 1,052 other POWs, Bob was killed. Apart from his older brother, my father’s twin brother was also killed in World War II. In Tom’s case, he was shot down over Rabaul on his first (and final) mission. He was a wireless air gunner on a Beaufort Bomber. See ‘The Last Coastwatcher: My Brothers’. My childhood is dotted with memories of Bob and Tom. The occasional remembrance service, war medals and the rare story shared by my father. In 1966, the year I turned 14, I decided to devote my life to finding out why human beings kill each other and to work out how such killing could be ended. The good news about this ‘decision’ is that, at 14, it all felt manageable! But I wasn’t much older before my preliminary investigations proved that even understanding why humans are violent was going to be a profound challenge. And I intuitively understood that I needed this understanding if any strategy to end violence was to be effective. In any case, as one might expect, my research into violence and strategies for addressing it led me to nonviolence. I came across virtually nothing about nonviolence during my own studies at school and university but was regularly presented with news reports of people participating in activities – such as demonstrations and strikes – that I later learned to label ‘nonviolent action’. In 1981 I decided to seek out materials on nonviolence and nonviolent action so that I could learn more about it. I had not been reading for long when the routine reference to Mohandas K. (or Mahatma) Gandhi, about whom I had heard a little and knew of his role in leading the Indian independence struggle, forced me to pay more attention to his life and work. So I sought out his writing and started to read some of his published work. An Autobiography: The Story of My Experiments with Truth was an obvious and early book but there were many others besides. I also read many books about Gandhi, to get a clearer sense of his life as a whole, as reported by his coworkers and contemporaries, as well as documented by scholars since his death. And I spent a great many hours in a library basement poring over The Collected Works of Mahatma Gandhi. The thing that struck me immediately about Gandhi was that his own interest in tackling violence had a comprehensive ‘feel’ about it. That is, he was not just interested in the violence that occurs when nations fight wars or one person kills or injures another. He was interested in addressing the violence that occurs when individuals and nations exploit other individuals/nations (such as when British imperialism exploited India and Indians) and the violence that occurs when a structure (such as capitalism or socialism) exploits the individuals within it. In his words: ‘exploitation is the essence of violence’. He was interested in the violence that occurs when members of one social group (say, Hindus) ‘hate’ the members of another social group (such as Muslims). He was interested in the violence that occurs when men oppress women or caste Hindus oppress ‘untouchables’. He was interested in the violence that occurs when humans destroy the environment. And he was interested in the violence that one inflicts on oneself. This comprehensive interest resonated deeply with me because, apart from war, my own childhood and adolescence had revealed many manifestations of violence ranging from the starvation of people in developing countries to the racism in the United States (highlighted by Rev. Martin Luther King Jr. during the 1960s) to the destruction of the environment, each of which had gradually but deeply embedded itself in my consciousness. Tackling violence was a far bigger task than the large one I had originally imagined. Violence is everywhere. Most importantly, it seemed to me, there was enormous violence directed against children in the family home but little was spoken or written about this. So how did Gandhi explain violence and what was his strategy for addressing it? For Gandhi, conflict was a perennial condition. He also viewed it positively and considered it desirable. For him, it is an important means to greater human unity precisely because their shared conflict could remind antagonists of the deeper, perhaps transcendental, unity of life, which is far more profound than the bond of their social relationship. He viewed violence differently, however. And, as might be gleaned from the many configurations of violence that concerned him, as noted above, he considered that violence was built into social structures and not into people. Fundamentally, as Leroy Pelton characterized it, Gandhi understood that the truth cannot be achieved through violence (‘which violates human needs and destroys life’), because violence itself is a form of injustice. In any case, violence cannot resolve conflict because it does not address the issues at stake. To reiterate then, for Gandhi there was nothing undesirable about conflict. However, Gandhi’s preoccupation was working out how to manage conﬂict without violence and how to create new social arrangements free of structural violence. The essence, then, of Gandhi’s approach was to identify approaches to conﬂict that preserved the people while systematically demolishing the evil structure. Nevertheless, he ﬁrmly believed that structural puriﬁcation alone is not enough; self-puriﬁcation is also essential. In other words, in Gandhi’s view, resolving the conﬂict (without violence) is only one aspect of the desired outcome. For Gandhi, success also implies the creation of a superior social structure, higher degrees of fearlessness and self-reliance on the part of both satyagrahis (nonviolent activists) and their opponents, and a greater degree of human unity at the level of social relationships. Despite the enormous influence that Gandhi had in shaping my own conception of conflict and the precise conception of nonviolence that should be used in dealing with it, I nevertheless remained convinced that two questions remained unanswered: What is the psychological origin of the violent behavior of the individual who perpetrates it? And what theory or framework should guide the application of nonviolent action so that campaigns of all kinds are strategically effective? The first question is important because even if someone is trapped within a social structure (such as the class system) that is violent, the individual must still choose, consciously or unconsciously, to participate (as perpetrator, collaborator or victim) in the violence perpetrated by that structure or one must choose, consciously, to resist it. Why do so many individuals perform one of the first three roles and so few, like Gandhi himself, choose the role of resister? The second question is important because while Gandhi himself was an astonishingly intuitive strategic thinker (whose 30-year nonviolent strategy liberated India from British occupation), no one before him or since his death has demonstrated anything remotely resembling his capacity in this regard. Hence, while nonviolence, which is inherently powerful, has chalked up some remarkable successes, vital struggles for peace (and to end war); to halt assaults on Earth’s biosphere; to secure social justice for oppressed and exploited populations; to liberate national groups from dictatorship, occupation or genocidal assault; and struggles in relation to many other just causes limp along devoid of strategy (or use one that is ill-conceived). So badly are we failing, in fact, that humans now teeter on the brink of precipitating our own extinction. See ‘Human Extinction by 2026? A Last Ditch Strategy to Fight for Human Survival’. Anyway, having studied Gandhi extensively and learned from his strategic approach to nonviolence (elements of which I was progressively including in nonviolent campaigns in which I was involved myself), I resumed my original research to understand the fundamental origin of human violence and also decided to develop a strategic theory and framework for addressing violence in the campaign context so that Gandhi’s strategic thinking could be readily copied by other nonviolent activists. It turned out that developing this strategic theory and strategy was simpler than the original aim (understanding violence) and I have presented this strategic thinking on two websites: Nonviolent Campaign Strategy and Nonviolent Defense/Liberation Strategy. Despite my preliminary efforts in the 1990s to encourage fellow activists to use this framework, it soon became clear that only the rarest of activists has the capacity to think strategically about an issue, even when presented with a framework for doing so. Consequently, the vital importance of understanding the origin of human violence was starkly demonstrated to me yet again because I knew it would answer key supplementary questions such as these: Why to do so many people live in denial/delusion utterly incapable of perceiving structural violence or grappling powerfully with (military, social, political, economic and ecological) violence? Why is it that so many people, even activists, are powerless to think strategically? How can activists even believe that success can be achieved, particularly on the major issues of our time (such as the threats of nuclear war, ecological devastation and climate cataclysm), without a focused and comprehensive strategy, particularly given elite resistance to such campaigns? See ‘The Global Elite is Insane Revisited’. Hence, in an attempt to answer questions such as these, Anita McKone and I went into seclusion in an endeavor to understand how our own minds functioned so that we might better understand the minds of others. I hoped it would take a few months. It took 14 years. So what is the cause of violence in all contexts and which, depending on its precise configuration in each case, creates perpetrators of violence, people who collaborate with perpetrators of violence, people who are passive victims of violence, people who live in denial/delusion, people who are sexist or racist, and activists who cannot think strategically (among many other adverse outcomes)? Each of these manifestations of human behaviour is an outcome of the adult war on children. That is, adult violence against children is the fundamental cause of all other violence. How does this happen? It happens because each child, from birth, is socialized – more accurately, terrorized – so that they fit into their society. That is, each child is subjected to an unrelenting regime of ‘visible’, ‘invisible’ and ‘utterly invisible’ violence until they offer the obedience that every adult – parent, teacher, religious figure… – demands. So what constitutes ‘visible’, ‘invisible’ and ‘utterly invisible’ violence? ‘Visible’ violence includes hitting, screaming at and sexually abusing a child which, sadly enough, is very common. But the largest component of damage arises from the ‘invisible’ and ‘utterly invisible’ violence that we adults unconsciously inflict on children during the ordinary course of the day. Tragically, the bulk of this violence occurs in the family home and at school. For a full explanation, see ‘Why Violence?’ and ‘Fearless Psychology and Fearful Psychology: Principles and Practice’. ‘Invisible’ violence is the ‘little things’ we do every day, partly because we are just ‘too busy’. For example, when we do not allow time to listen to, and value, a child’s thoughts and feelings, the child learns to not listen to themSelf thus destroying their internal communication system. When we do not let a child say what they want (or ignore them when they do), the child develops communication and behavioral dysfunctionalities as they keep trying to meet their own needs (which, as a basic survival strategy, they are genetically programmed to do). Well, if you want to make an enormous contribution to our effort to end violence, you can make the commitment outlined in ‘My Promise to Children’. If you need to do some healing of your own to be able to nurture children in this way, then consider the information provided in the article ‘Putting Feelings First’. So if your passion is campaigning for change, consider doing it strategically, as Gandhi did. See Nonviolent Campaign Strategy. Anticopyright: Editorials and articles originated on TMS may be freely reprinted, disseminated, translated and used as background material, provided an acknowledgement and link to the source, TMS: Learning from Gandhi, is included. Thank you.